It’s been a quiet couple of days. I decided to sleep in on Monday (thereby skipping my Outremont route) and this morning I woke up to pouring rain which forced me to cancel my Villeray run. I made it out to the Plateau West yesterday evening and I made a few small finds. I found this camera tripod in the pile above along with two big boxes of VCR tapes and a bunch of musty clothes. I’m guessing this stuff spent too much time in the basement. 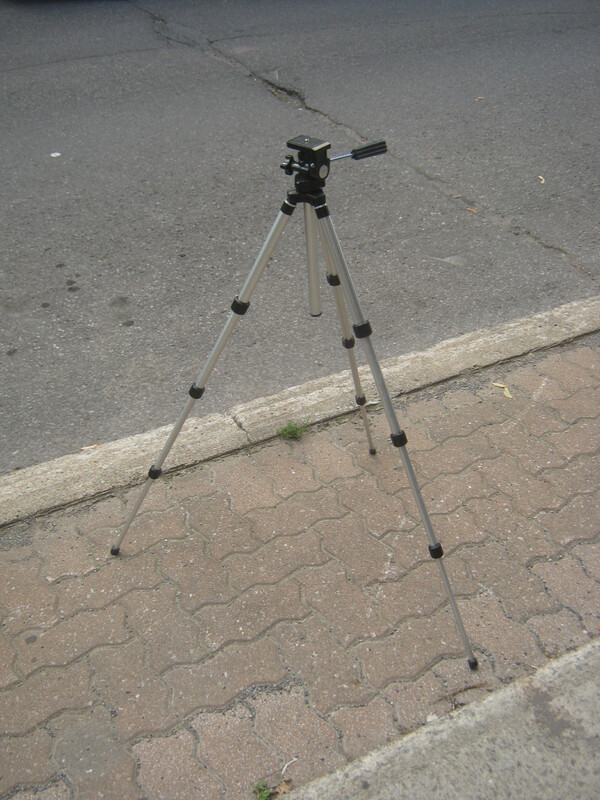 The tripod is fine, though, and is the third fully-functional tripod I’ve found this summer. I kept the first two (one big, one small) for myself but I won’t be needing a third. I’m going to throw it in the yard sale for, say, 15 bucks – it works fine but it’s not particularly fancy. 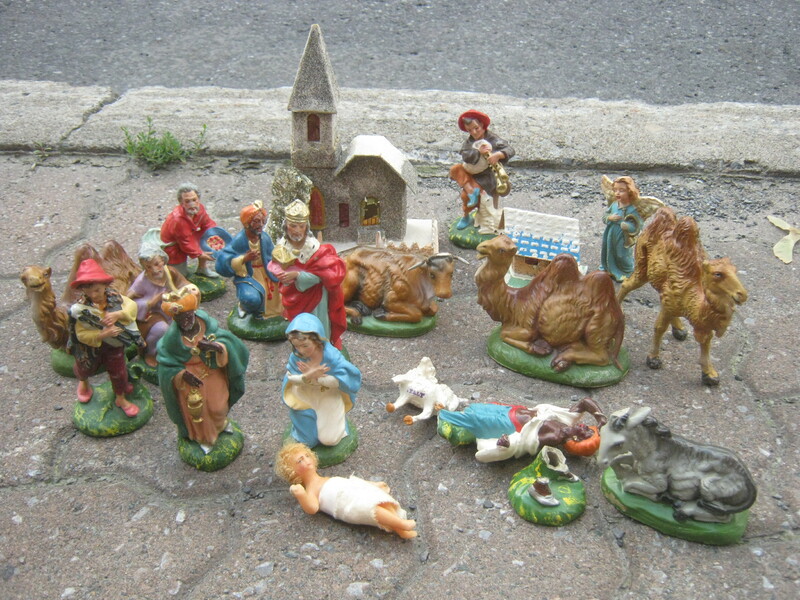 These nativity scene pieces were in a bag in front of a house on Drolet near Laurier. They’re all marked “Hand-painted Italy” other than the building pieces in the back which are marked Japan (and don’t really fit with my concept of what a nativity scene looks like). A few are broken but others are in pretty good shape. There might be a bigger market for these as Christmas approaches. Finally, I spotted this old wind-up watch in a bag full of non-descript kids toys. The trash looked to be the kind of stuff young parents would throw out in preparation for a move. The watch doesn’t work, unfortunately; it goes for a few seconds when you hit it but it seizes up pretty fast. You can see that there’s a bit of rust near the winder which is probably the culprit. 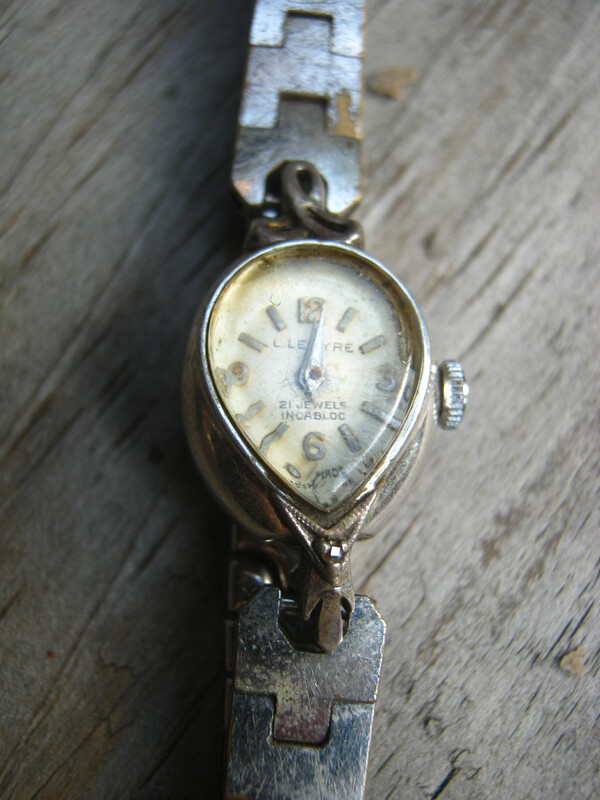 Still, the watch contains 21 jewels, which in a watch this age are probably synthetic sapphire or ruby. The jewels are there to (somehow, I can’t say I have any idea how it works!) to increase accuracy and durability by reducing friction. 21 jewels should mean a high-quality watch but the number of jewels was marketed as a (totally false) indicator of quality for a while (culminating in a ridiculous 100 jewel watch, of which 83 were completely non-functional) so it’s hard to say for sure. This watch might still be worth a few bucks (but not much more than that) to someone on Ebay. 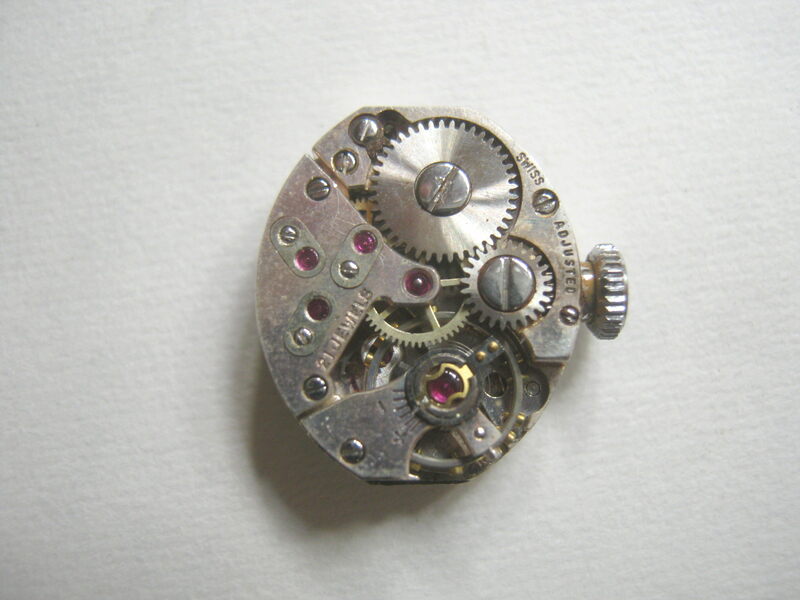 Still, the insides of old wind-up watches are always cool to look at. 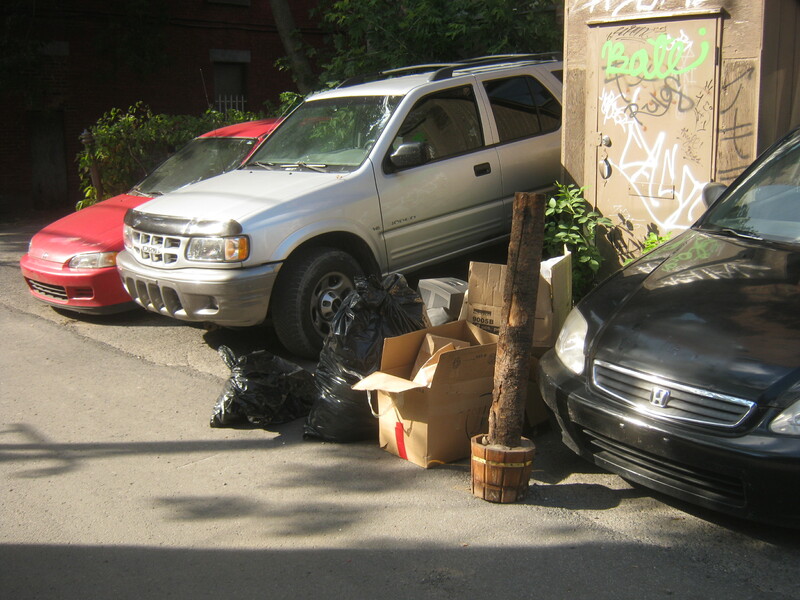 Yesterday I started working on a guide to my Montreal garbage routes. I want to take some pictures to go along with it before I make it live but I hope to get that done in the next week. Tuesday evening is the “Plateau East” route. Hopefully I come across some good finds! Interesting watch. I can’t quite make out the name, but I expect you Googled it masterfully. I would think if it goes for a bit before stopping, that the problem isn’t a major one. Use the tripods for a diy tripod lamp, perhaps? No, he should sell it. I’ve only found one tripod in years of looking at garbage, and it was broken. It was only later that I realized I should have grabbed the top part, to use for mounting a camera over a desk to take pictures of books too big for the scanner. So I’d say they aren’t that common in the garbage, and unless someone takes a lot of photos, likely professional, they don’t need a lot of tripods. So someone is likely to spend some money on the tripod, and that money can be spent on things that aren’t found in the garbage. That being said I’d likely wait until I find one missing the headset (a fairly important part) and perhaps make a lamp with that. That way I could up the value and also have a cool (and very stable) lamp. I’m also moving soon, and I’m focused (perhaps obsessed) with moving as little with me as possible! Is that an improvised baby Jesus? We had kinda weird nativity scenes like that when I was growing up- some strange elf visiting the stable, towering above all the other figures, or a cowboy mysteriously showing up. Haha, yes this Jesus looks pretty improvised for sure. As do some of the other pieces… some seem to be part of a set however.